Coming off the coast for resupply went smoothly. It would be the first of many times entering various towns for food. This resupply would would also be a chance to switch out pieces of gear to prepare for sleeping in the snow filled mountains - gear such as warmer sleeping pads, bag and extra layers. The Hoh Rainforest is a magical place. The trail starts at the Hoh Visitors Center, and follows the river (mostly) for 13 miles, before climbing up towards Mount Olympus. Most hikers (especially climbers) base camp their tents at Glacier Meadows, before heading to the Blue Glacier. The increased popularity of this area, has caused it to become a quota area (limited camping numbers). So it's suggested you make your camp in the river valley bottom, before climbing up to visit the mountain, if you are looking just to visit the glacier and not make a summit attempt. Interested in learning more? 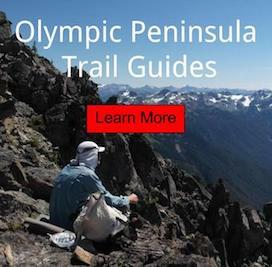 Guides to every trail on the Olympic Peninsula. For the next leg I planned to be in the wilderness for eight days - which meant my backpack was heavier than it had been all year. With an ascent profile of 12,000’+ of elevation changes, it would be a good test for my fitness level. I would be traveling various surfaces such as endless mud, water, rock, ice and lots of spring snow at higher elevations. I also expected it to be a great mental test, with grand rewards. The first 12 miles of the Hoh River Trail was a complete swamp, from the storm just before. In fact it rained on me the first day and night. Sleeping out in these conditions was not real pleasant. 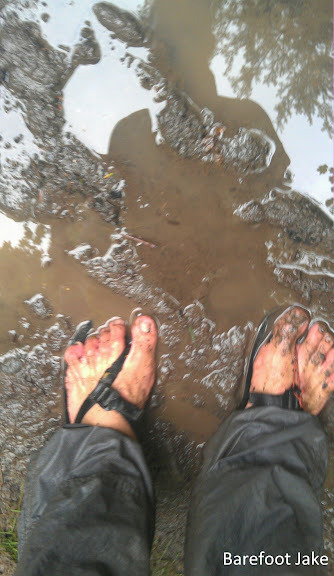 Every inch of the rainforest floor was completely saturated with water. This was the only photo taken within that time period, I was rather grumpy. The next day I was happy to reach the High Hoh Bridge. This marks a place where the path starts to head up into the mountains. I knew the mud was over with and this lifted my spirits. This view is looking off the High Hoh Bridge, where Glacier Creek merges with the main river. It is a further drop that it appears. After ascending a few thousand feet up the side of Olympus, one can look back to see the Sol Duc Divide area. It appeared that Cat Basin, which was going to be my home in a few nights, still had some snow. Good thing I packed my snow camping kit. First views of the mountain along the trail. It is cool to imagine how big the White Glacier once was. Now it just sits by itself in the foreground. This is where it starts to sink in about the real contrast within the Park. Walking the Olympic Coast and following a river to its glacier source, is one of the best ways to truly experience the Olympics (in my opinion). A few minutes before arriving at Glacier Meadows, which is base camp for many climbers, you see a landslide section that took out the trail a few years back. The climbing rangers are nice enough to put in a rope ladder for assistance. Once at the bottom, navigate the snow bridge and climb up to meet the remaining trail on the other side of the gully. From a base camp, the next day I ventured onto the Blue Glacier to attempt the mountain. My original plan was to sleep two nights on the Snow Dome, but I chickened out on account of daytime highs and evening lows above 50 degrees F. The snow was too soft for my liking. Making things more interesting because of warm weather, all the snow bridges that cover unseen crevasses would be at higher risk of collapse. This makes foot placement all the more important. This open crevasse gives an idea of the Blue Glacier snow coverage. Midway across the Blue Glacier, I decided to stop for a panoramic photo. Now just to head toward the Ice Fall section and hang a right. Vibram EL-X on the Blue Glacier. The sole pattern works well in these conditions. This one meant a running jump, to avoid a soft snow bridge over the crevasse. Being a poser, in front of the Ice Fall section of Mount Olympus. This is my favorite part of the mountain. One can hear the creaks and moans of the ice shifting, especially on a warm day. Now for a right turn and the begin of ascent up the steep side of the massif. Next stop, top of Snow Dome.